Trump’s approval ratings now are relatively poor, despite a good economy, which is probably why he mentions it at every turn. What is striking is how he talks about job creation — that any job growth is essentially his doing. In our recollection, this is different than other, recent presidents. How much does Trump have to do with job creation in the first six months of his presidency? Here’s a sampling of how other presidents have spoken about job creation. Note the difference. The economy has added jobs, America has added jobs, “we have worked together” and so forth. Obama, in particular, also liked to say that “our businesses” have added jobs, so that way he could cite the better private-employment numbers; the drop in state and local government employment during much of his presidency kept dragging down overall employment numbers. All presidents try to pat themselves on the back if the economy is doing well. But Trump drops any pretense and simply says that he, himself, created more than 1 million jobs in six months. But economists say that presidents don’t really deserve credit for job creation, especially at this stage of a presidency. “Trump overuses the pronoun ‘I,’ always, but presidents always claim more credit than they deserve when things go well,” said Alan S. Blinder, a Princeton University professor and former vice chair of the Federal Reserve. Blinder in 2015 co-wrote a paper that explored why the U.S. economy since World War II appears to do better under Democratic presidents than Republican ones. (“Over a typical four-year presidency the U.S. economy grew by 18.5% when the president was a Democrat, but only by 10.6% when he was a Republican.”) An empirical analysis found much of the difference could be explained by a blend of good policy and good luck, but the authors could “not attribute any of the partisan growth gap to fiscal or monetary policy.” Instead, oil shocks and productivity growth — both of which are tenuously connected to a president’s policies — played a more substantial role in the difference. In short, it’s difficult to find a link between a president’s policies and economic growth. In terms of employment, a president can hire and fire federal workers but has little direct impact on private employment. In the first six months of Trump’s presidency, there have been slightly more than 1 million jobs created, according to the Bureau of Labor Statistics. But Burtless noted there’s been very little change in the trend in employment in the first six months of 2017, compared with the same period in the previous four years. In fact, the gain in payroll employment in the January-through-July period was a bit slower in 2017 compared with the previous four years, whether measured as an absolute rise in the number of nonfarm payroll jobs or as a percentage of employment in January of the indicated year. In other words, there’s been barely any change from the Obama-era economy, which Trump bashed at every turn when he was running for president. Trump might have a better case for bragging if he could point to major new policies that had been rapidly adopted and quickly implemented, as was the case with Franklin D. Roosevelt in 1933, Ronald Reagan in 1981 and Barack Obama in 2009. But Trump has not achieved much on the legislative front. In any case, as we noted, Blinder could not find much impact from fiscal policy. Economists, after all, have disagreed about whether Obama’s fiscal stimulus helped or hurt the economy. 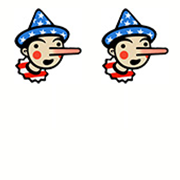 As a general rule of thumb, the Fact Checker automatically assigns Two Pinocchios for claims that a president is responsible for job growth. That kind of statement simply lacks context — and ignores the fact that it takes time and effort for presidential policies to work their way through a country as large as the United States. Trump’s rhetoric, suggesting he is personally responsible for 1 million jobs being created, almost pushes it to a three. But at its core, this is a statement that lacks a lot of context about how the U.S. economy functions.